I added an apple after I took pictures, because I didn't think I'd adequately kept the nutrition of the original menu. 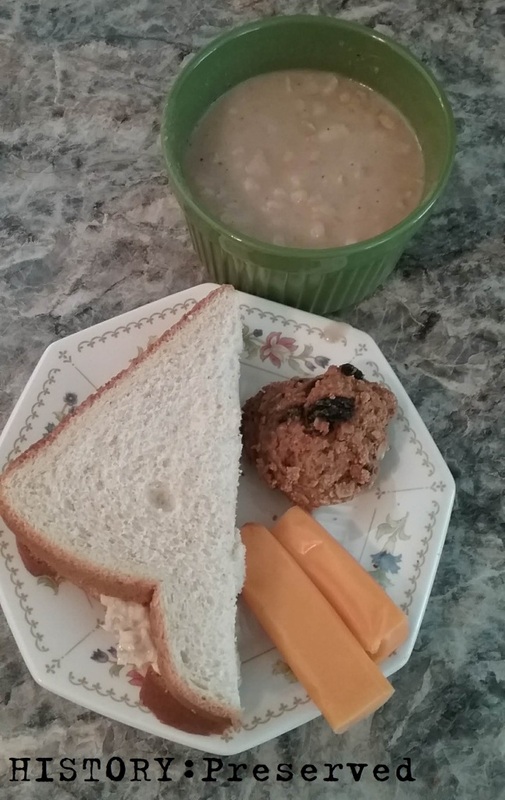 I made the oatmeal cookies from a different August menu, so I decided to use them in this meal, though, believe me, I would have much preferred some Apple Turnovers! I didn't have any meat or spare veggies to chop up, so I went with the only meat I had in the cabinet - canned salmon. I've never had canned salmon on a sandwich. I really wanted tuna, but I didn't have that either. I've only ever used the salmon in salmon loaf or fish cakes. I wasn't a fan of it on a sandwich. Nothing can really replace tuna! I was getting over a tummy bug, too, so I didn't finish the sandwich. And now the moment you've all been waiting for: the Navy Bean & Peanut Butter Soup! The night before I soaked the beans, and it was a surprisingly small amount. This was good, though. The recipe only made about 2-3 servings which is perfect for a scary recipe like this one. You don't want a huge pot of the stuff if you hate it! 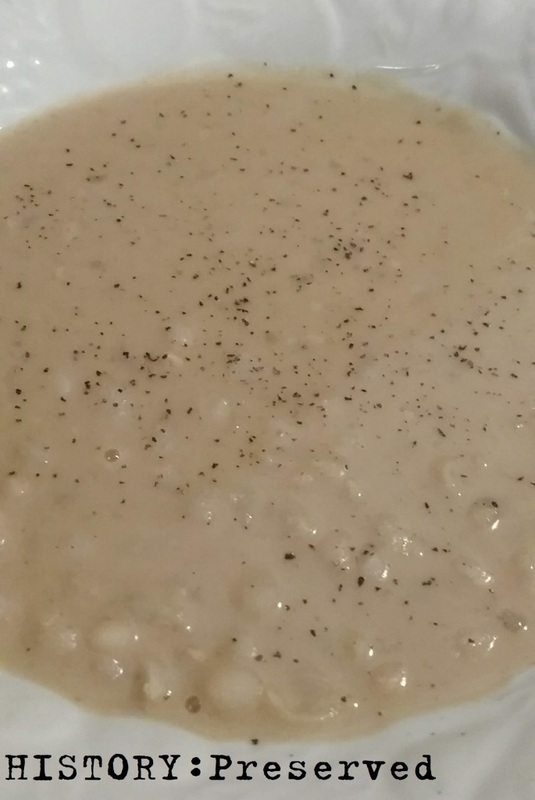 The next day I rinsed and cooked the beans with onions and at the end added the salt and pepper and the peanut butter blended and heated with milk. Just as I was dishing it into a bowl to try, my son says from the other room, "Is that peanut butter cookies I smell?" I just cackled evilly and shouted back, "You wish!" to which he responded, "Nooooo!!!" mwahahaha! That kid knows all too well that when Mom gets in the kitchen to do ration cooking, it'll be a Russian Roulette for his visions of cookies, cakes, and delicious things. hahaha! So, I tasted the soup... and it was actually quite good! There's some good substance and it's got the savory nutty flavor going on too. The onion is key to this recipe, otherwise it would taste flat. When you eat it, you really have to think more of Thai peanut dishes and you'll be fine. If you think peanut butter cookies, like my son, then you'll be in trouble. For the very few menus I've been able to do, it's been a lot of fun and very interesting. I've learned that I've got a long way to go before I have the stamina to carry off complete 1940s menus on a regular basis, let alone modern ones. Ha! I'll be taking a break in September from challenges, but in October, I've got a fun new series I'm starting up, so stay tuned! I don't think I ever would have been brave enough to add peanut butter to a soup, glad it turned out good for you.